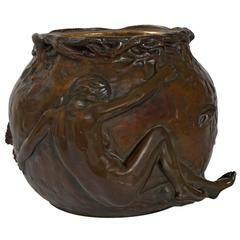 A Tiffany Studios New York patinated bronze "Arrowhead" jardiniere with favrile mosaic glass and a copper interior by Louis Comfort Tiffany. The beautifully striated blue and green glass mosaic arranged in Stark geometric patterning is juxtaposed in this stunning piece by the flowing natural forms executed in bronze, circa 1905. 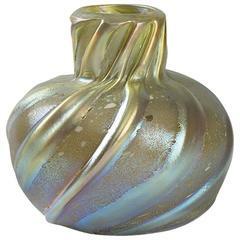 Signed, ''Tiffany Studios New York 835''. Awaji Pottery jardiniere with applied decoration of dragons amidst clouds and a three color drip glaze, circa 1920s. Measures: 12" high, 14" diameter. Excellent condition. Delphin Massier Majolica jardinière which features flowering thistles. Coloration: cream, pink, green, are predominant. The piece bears maker's marks for the Delphin Massier pottery. This stone planter is from France and was made, circa early 1900s. It is carved from limestone and features attractive lichen spots and discoloration. A few minor chips. Mainson Jansen style jardinière pedestal in stainless steel and brass with high-quality chasework. Empire style jardinière with burl wood and ebony-finished C-curved supports. Brass mounts. Very decorative and functional piece. 19th century pair of French Majolica lily of the valley jardinieres.